……perfectly lit with light beaming from up above, from a mute chandelier above the gathering spot, so refreshing. This gathering spot is the large kitchen island that is placed in the center of the space. The kitchen island lighting illuminates the tile top and the room while the arched open windows in the morning are sure to supply adequate natural light . The walls in this Tuscan home are a warming tan color which represents the warm weather experienced pretty much year round in Tuscany. The kitchen cabinets are distressed and worn looking. 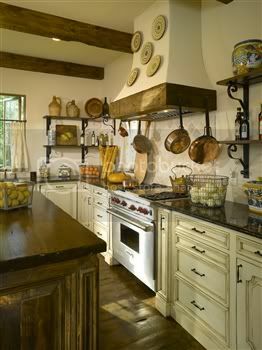 Old World charm is what this kitchen is expressing. An impressive apron sink is just the right touch to allow for plenty of space to wash the vegetables we picked from the Tuscan garden . The kitchen cabinet doors are picture framed with glass panels. This gives the illusion of “door-less” cabinets. Displayed are the hand-painted dishes , pottery, jars and utensils neatly placed on the shelves. Beautiful, sturdy granite counter tops grab perfect parts of the illumination from the light in the room. How about golden hardwood flooring that makes this Tuscany kitchen feel like a real farmhouse on the countryside? It’s absolutely perfect. It’s Tuscan kitchen design. Sign up for our free newsletter to get access to kitchen design ideas and pictures of Tuscan kitchens. Click here to subscribe!